You might know me better as a Russian Wolfhound, and I think that my Saluki and Greyhound heritage is evident in my looks and physique. My coat is long and silky and isn't a major chore to take care of. I really enjoy my own people family, but I'm not always overly friendly with strangers � I just ignore them. I can run like a streak of lightning when the mood strikes me, so it will be necessary to keep me contained. I much prefer to have a very big area to play and run, but I can live in the city if I have the opportunity to exercise a lot. When fully grown, I am between 27 and 29 inches tall (68.6 to 73.7 centimeters) and I weigh between 60 and 105 pounds (27 to 47.3 kilograms). 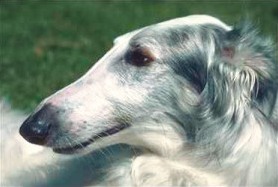 We have no Borzoi Breeders listed at this time. Click here to place your Borzoi Ad!